I am trying to sort data in a pivot table. I am hoping to end up with a table that has row labels with my data types, and then 12 monthly columns with a count of each type in each column. So far I have 12 columns that have a full year total in each column. I now need to filter that down by month. I have a field that has date and time in it, so I would want to filter on that field. I don't see a date option to filter by - rather I have a value filter option. I can only filter on the count of the incident type, rather than on the dates. If I try to manually filter I will be checking hundreds of boxes to get the count for each date in the month. How do I filter this by date? 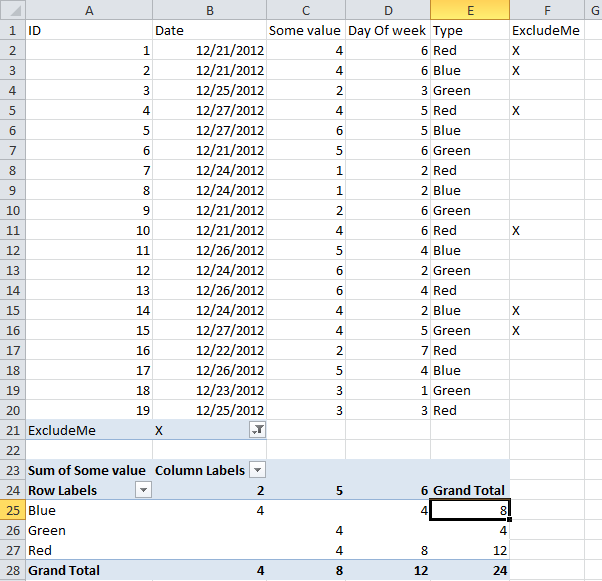 Add a formula that marks the record for exclusion on column F and then use that as the filter in the pivot table. Not the answer you're looking for? Browse other questions tagged microsoft-excel pivot-table or ask your own question. Excel Pivot Table - How can I return a date in the row value?